Mineral wheels are used to help explain complex relationships between minerals, vitamins and hormones to each other. Mineral wheels are a visual guide that associate the various essential minerals with each other in a graphical presentation. The following information is from the Trace Elements website, which is a world leader in hair tissues mineral analysis. 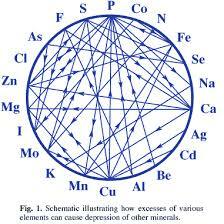 Below are links to the PDF mineral wheels that show the various relationships between nutrients. These findings were developed by David L. Watts, Ph.D. Director of Research for Trace Elements, and published between 1988 and 1994 in the Journal of Orthomolecular Medicine. Over ninety percent of the calcium in the body is stored in the bones and teeth, which act as reservoirs in which the calcium can be withdrawn as required for extra-skeletal functions. Calcium is found in virtually every cell throughout the body and is considered a biological messenger responsible for carrying signals to target activities with cells through specific calcium channels. Calcium is regulated in tissues and serum at the expense of skeletal structures. It is regulated by the parathyroid, and kidneys and is affected by insulin, adrenal, as well as male and female hormones. An imbalance of calcium relative to its synergistic and antagonistic nutrients can be a major contributor to osteoporosis even with adequate dietary calcium intake. Chromium is an essential trace mineral, important in processing carbohydrates and fats, and helping cells respond properly to insulin. It is known that chromium is a constituent of the glucose tolerance factor (GTF) and is synergistic with insulin in promoting cellular glucose uptake. Chromium is important for the structure and metabolism of nucleic acids. A number of physiological and disease conditions are related to chromium status. Copper is a constituent of many enzymes including cytochrome c oxidase, superoxide dismutase, ceruloplasmin, dopamine B-hydroxylase, lysyl oxidase and monoamine oxidase. An imbalance of copper relative to other nutrients can disrupt the activity of these important enzyme functions. It should be noted that excess copper is just as serious as copper deficiency. The antagonistic nutrients shown in the following chart can aid in reducing excessive tissue copper burdens. Iron is involved in many metabolic processes, particularly enzymes, and as a result, many clinical manifestations, including anemia, can develop as a result of iron deficiency. While anemia is of course the most recognized condition related to iron deficiency, other conditions, such as; sideropenia can contribute to disturbances in immuno-modulation, endocrine, physical and even emotional disorders. Iron excess or toxicity can be found at the opposite end of the iron status spectrum, and can be specifically addressed by providing nutrients that are antagonistic to iron. Magnesium is the fourth most abundant cation in the body and is a key element in cellular metabolic functions. Magnesium is responsible for activating over 200 critical enzymes. Due to the extensive role of magnesium in biological processes recognizing its synergistic and antagonistic role with other nutrients is extremely important and can greatly enhance its therapeutic effectiveness in many health conditions. Manganese is located largely in the mitochondria of the cells. Therefore, the structure and function of mitochondria are particularly affected by manganese status. Manganese is not only responsible for activation of mitochondrial superoxide dismutase, but it also activates enzymes associated with fatty acid metabolism and protein synthesis, which are highly important for normal cellular function. A direct biochemical role for selenium was found in its’ relationship to glutathione peroxidase activity. Selenium’s synergistic relationship to vitamin E found it to be an inhibitor of chemical carcinogens by accelerating their detoxification. Selenium protects against chromosomal damage, stimulates DNA repair and modulates the rate of cell division. Selenium has since been found to play a role in normal thyroid expression and aids in the peripheral conversion of T4 to T3 in the liver and kidneys. Zinc is another important element that is essential for the activity of over one-hundred enzymes. Zinc is involved in immune regulation, anti-viral activities, growth and development, and perhaps its most important role is the requirement of zinc in the synthesis of RNA. The balance of zinc with other nutrients within the body is therefore critical for normal health but assessment of this balance is critical when providing nutritional therapy. This nutritional wheel shows the common biological antagonisms between the hormones. Hormones are known to affect nutritional status at several levels including absorption, utilization, excretion, transport and storage of nutrients. Nutrients in turn can exert an influence on hormones affecting their secretions, activity, transport, receptors and target tissue binding sites. Assessing nutritional status cannot be considered complete without evaluation of the nutrient-endocrine interrelationships.